I have a gig to write about! Cool. Haven’t played a show in about nine months and haven’t played the drums more than a few minutes since then. Got a call from a long time friend and guitar player to play and outdoor gig on the patio of a deli this weekend, a few days notice. I’d heard their band before, sort of a funky instrumental band with a sax player. I accepted the gig, the best part being that included in the gig is a free sandwich. This deli is the best in town so that was good. In the old days it was cool to play and get free beer, but I’d much rather play for an Italian Muffaletta with spicy olive and pepper spread than Bud Lite. Pleasant summer evening jazz gig on the patio at Caputos. They sent me some mp3 files to listen to before the gig to familiarize myself with their set list. It was at that point that I realized this gig would be much more on the jazz side than the funk side. Having not played in a long time, and having not used brushes and hotsticks for about 500 years, this gig would be interesting. I wondered whether or not I could play, first. And second, could I play swing and play brushes? I hadn’t busted out the small gig kit for a whole so I checked it out in the afternoon before the show. I had some new heads for the toms and figured it was time to install them. The old heads were hammered. The new heads were great for this gig, nice and ringy/jazzy. I’d intended to practice a bit before the show, but this past week was a bit nutty on the schedule. So except for about 20 minutes on a practice pad, I went into the gig with no chops. Fortunately, the gig was very casual and laid back. Most the tunes were jazz improvisational style. The configuration was only a three piece, guitar-bass-drums. No sax. The toughest parts of the gig weren’t playing swing or brushes as I’d expected. The toughest part was playing soft. For nearly three decades I’d developed a style of playing that was all about power and making a lot of sound, to make the power trio rock band sound full. All of my snare hits were rim shots for added volume and pop, and my kick drum technique is like dropping 100 pounds of lead on the pedal with every hit. With lighter 5A sticks, hotsticks and brushes I was able to keep the volume under control minus a few accidental big rim shots. The toughest part of adjusting to the lighter, jazzy sound was the lead foot kick. Normally the heel is off the ground and I put the whole leg into it. But trying to do that at low volume simply didn’t work. I had to change it up entirely, with the heel down. That made a big difference, but my control was sketchy as would be expected. And sometimes I could hear the beater sort of double hitting on the head. All in all the gig went well and the guys I played with seemed satisfied at my playing. It was nice to play a show, and the atmosphere outside on this patio was great. 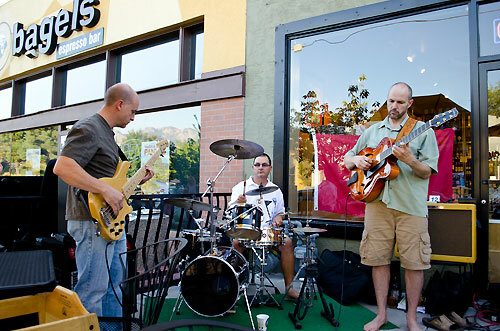 There were a lot of people not only on the patio we played at, but at surrounding restaurants and a nearby Starbucks. The area didn’t look like anything you’d see in Utah. I felt like I was playing a gig in Brooklyn. I hope that wasn’t the only gig I get to play with these guys. I’d like to find some regular gigs playing something jazzy, funky or even some Latin. If you are interested, we were wondering if you may return the favor and link back to our audio engineering section (where students can find audio engineering schools) somewhere on your site. If you can, please link back to: smartschoolfinder.com/guide/audio-engineering-schools with the link text ‘audio engineering schools’ or ‘audio engineering education’, or whatever you’d like.